Littleoverripe.com is a web painting written with current web standards. Naturally, therefore, this painting will not work in Microsoft Internet Explorer or Edge. I don’t care. It should work on all current major browsers on most devices. I keep coming back to this idea that an artworks are slabs of time. I think this is particularly true of paintings, but it works for websites, sculptures, or anything really. A raw, unprocessed, unedited photograph might capture 1/16 of a second of time between the open and close of the shutter. There might be hours of time in post processing and editing. A photograph still reads as an instant. The time involved gets flattened out. I think this is why we pore over thousands of Snaps and Instagrams instead of looking at a single photo for very long. But an artwork that is made over time - paint, pixels, whatever - carries with it a record of it’s own history. We can see that the author was there doing something for some amount of time. We can feel the weight of that time when we view art. I think that expenditure of our only real resource - time - is what imbues art with its intrinsic value. Arthur Danto, in “What Art Is“, defines a work of art as embodied meaning - art is about something. But art is also made out of something, and ultimately, when you strip away all the material, art is made of time. Time invested in learning media and technique, time in observing and understanding the subject matter, and time involved in execution. If I wanted to stretch that definition, I might include the compound time of an artwork’s audience. “Little Overripe” began as a quick reference photo I took while making lunch. It was December 23rd, right before we left town for Christmas. We made tacos. I sliced up avocados. The light was cool and white from the north. I love painting avocados. I could make a career of it. These particular avocados were still ripe, just beginning to turn, black spots emerging from the yellow-green flesh here and there. These fruits were very temporary. I sat with the reference photo for nearly a month until I had a solid day to work on something. I had Martin Luther King Day off from work, so I took advantage of the time to make art. I beamed the reference photo over to my television and painted from the couch on my iPad. I recorded and saved a time lapse movie of my painting, as well as a couple of early, sketches. When painting on the iPad I’ve taken to creating a “palette” right on the picture where I can easily grab a color without leaving my work to poke around in a drop-down menu. I dissected the layers of the painting into on my laptop and assembled the website in ReactJS. I included the video, the palette, and sketches in the final composition. I realized I was creating a painting which acknowledged it’s own history. Because it’s a digital web-painting I can include an element of time. The painting’s own history lurks in its background. This work became about capturing a moment (and a mood) and then capturing the moments which lead to capturing the moment. 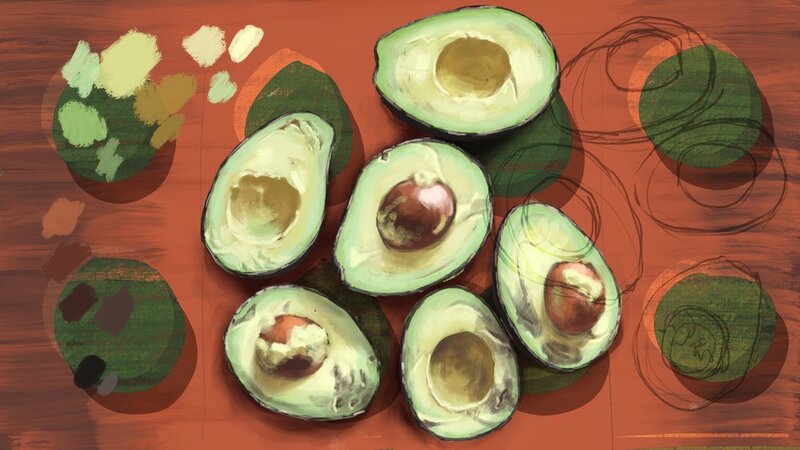 Also avocados are fun to paint.